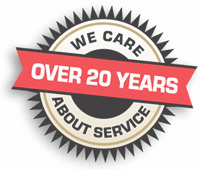 With the purchase of a (10) year parts and labor warranty plan with your new system you can enjoy years of worry free service. There will be no service repair charges for the life of your warranty agreement. We know systems don’t break down at the most opportune time. We have arranged to offer special financing for qualified buyers of complete system. CLICK HERE to apply for easy financing.